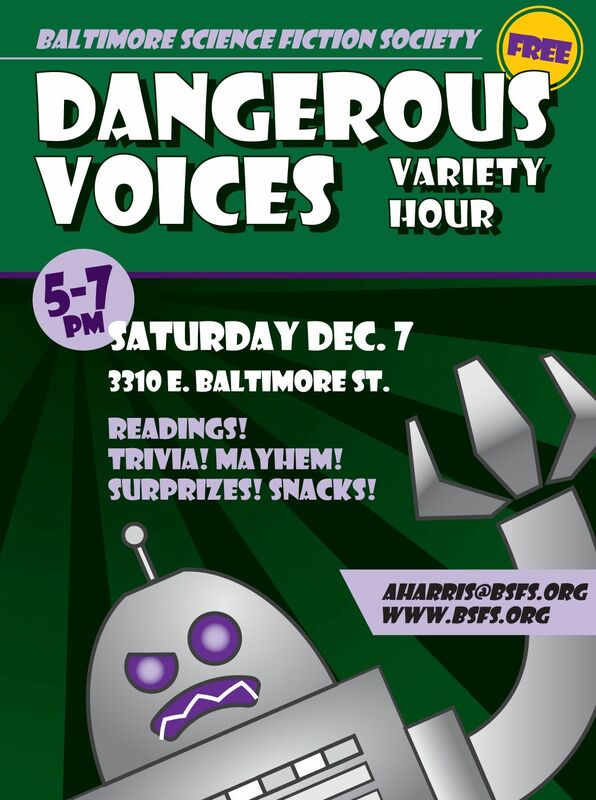 The Dangerous Voices Variety Hour is a new quarterly event of the Baltimore Science Fiction Society. Kicking off on Saturday, December 7 at 5 p.m., the ambitious two-hour program takes its inspiration from “the popular 510 reading series, NPR’s quiz show Wait Wait Don’t Tell Me, and Orson Welles’ original War of the Worlds broadcast” and will feature readings, irreverent author interviews, trivia, and prizes. A “soft opening” at the Baltimore Book Festival featured New York Times bestselling author Lois McMaster Bujold, Nebula Award-winner Andy Duncan, and local author John Zaharick reading to a packed tent. The December 7th official kickoff will feature two rising stars in speculative fiction, Fran Wilde and Leanne Rene Hieber. The series will be hosted by local authors Michael R. Underwood and Sarah Pinsker. Leanna Renee Hieber is an actress, playwright and the award-winning, bestselling author of Gothic Victorian Fantasy series such as the Strangely Beautiful saga, the Magic Most Foul Saga and the Eterna Files saga, coming in 2014 from Tor/Macmillan. Fran Wilde’s first novel is forthcoming from Tor in 2015, with two more to follow. Her short stories have appeared or will appear in Asimov’s, Nature, Beneath Ceaseless Skies, and The Impossible Futures anthology, and she runs the “Cooking the Books” interview series. Sarah Pinsker’s short stories have been or will soon be published in Strange Horizons, Asimov’s, Lightspeed, Fantasy& Science Fiction and several anthologies. Michael R. Underwood is the author of Geekomancy and Celebromancy. The program takes place at the BSFS clubhouse, 3310 E. Baltimore St. in Highlandtown. This entry was posted in Clubs and tagged BSFS by Mike Glyer. Bookmark the permalink.